If you have teeth damaged by decay or trauma, dental fillings can repair the function and aesthetics of your smile. At Windermere Dental Group in Orlando, FL, Dr. Susana Moncada can fill a cavity with high-quality composite resin, which is designed to strengthen your tooth and blend seamlessly in your smile. If you have a cavity, it is important to undergo timely treatment, as decay can progress into a dental infection and require more costly restorative procedures in the future. In the United States, cavities are common amongst children and adults. Data from a National Health and Nutrition Examination Survey suggests nearly 91 percent of Americans between the ages of 20 and 64 have at least one cavity. Individuals with a diet high in sugary foods are more susceptible to developing cavities. However, some also have a genetic predisposition to tooth decay. Dr. Moncada can fill a cavity with high-quality composite resin, which is designed to strengthen your tooth and blend seamlessly in your smile. Cavities are caused by plaque that builds up on the teeth. Plaque contains harmful acids that can erode the outer surface of the tooth, called enamel. Overtime, acid and bacteria can make their way to inner layers of the tooth, known as dentin. Once decay reaches the innermost portion, called the pulp, patients often require root canal therapy to save the tooth from extraction. When a cavity develops, you may be completely unaware, which is why it is important to visit the dentist every six months for a checkup. During these visits, your dentist can identify cavities in their earliest stages and recommend conservative treatment. Fillings can treat mild to moderate decay, whereas more severe cases may require an onlay or a dental crown. During treatment, we can remove compromised tissue and fill the tooth to protect it from bacteria and preserve the longevity of your smile. 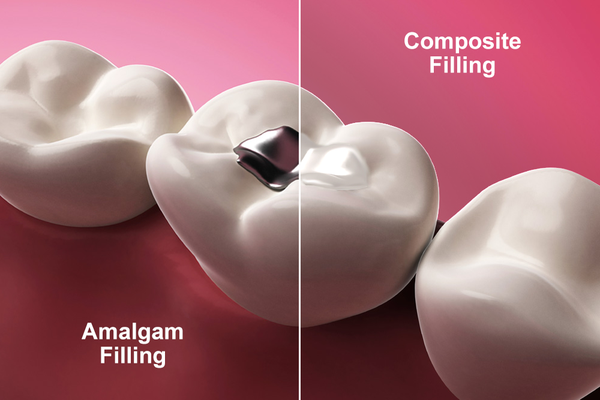 At our practice, we place composite resin fillings, which are designed to blend with the natural shade of your tooth. Traditionally, dentists used amalgam to repair decayed teeth. This metal alloy consists of a combination of silver, tin, copper, and mercury. Although durable in nature, this material requires dentists to remove more enamel during treatment and is highly visible, making it less aesthetically appealing. In comparison, composite resin provides a durable and effective solution for repairing teeth. This material is composed of a mixture of ceramic and acrylic, which can be tinted to match the natural shade of the tooth. As an added benefit, less tooth preparation is required, allowing Dr. Moncada to preserve more of your natural tooth structure. Composite resin also causes less wear and tear on the tooth in the long run, making it a strong and stable solution. Anesthesia: Before treatment begins, we can administer a local anesthetic to ensure your comfort. Tooth Preparation: Once you are comfortable, Dr. Moncada can remove damaged tissue and thoroughly clean the tooth. Composite Resin Application: She can then mix the composite material to match your tooth. Once it is ready, Dr. Moncada can carefully layer and sculpt it to ensure optimal results. Finally, she can apply a curing light to harden the resin for optimum strength. Tooth Polishing: Dr. Moncada can trim any excess resin to preserve your bite. She can then polish your tooth to reveal a healthy, beautiful smile. Our team is dedicated to your care and comfort and would be happy to answer any additional questions you have about dental fillings during your private consultation. If you are concerned you may have a cavity, we encourage you to call our office today at (407) 294-1132 to schedule an appointment. You can also contact us online. Our team at Windermere Dental Group looks forward to providing you with outstanding care and personalized services.